Our Inspection Rates are extremely competitive and we offer the best possible service without becoming a financial burden to you. NOTE: All inspections include a Complete Inspection Report. Weekend inspections are provided at no extra cost. Home Inspection Specialist To schedule an appointment Email us Today! Weekend Appointments Available! 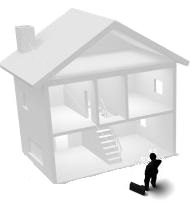 Prices may vary, depending on a number of factors, such as the size of the house, its condition and its age. Please contact us for price quote based on your specific needs. A Word About Prices BEWARE: Inspectors ARE NOT all alike! When pricing a Home Inspection please do yourself a favor and DON'T shop for the lowest price. DO SHOP for the most experienced, Certified inspector you can find. Buying a home is probably the single most expensive investment you will ever make. After you buy and move into your new home is not the time to find out you received a poor inspection report. This can become a nightmare. A good detailed inspection report can save you thousands of dollars. We have seen clients negotiate up to $10,000 to $20,000 off the price of the home then hire the cheapest inspector on the block. Going with a cheaper inspector, which means less experience and saving $50.00 to $75.00 on the inspection may cost you a lot of money at the negotiation table and in the long run. When Buying Your Next Home, Don't Be Surprised......BE SURE!